In what were both exciting finishes, Andy Birkett and Bridgitte Hartley bagged their maiden K1 Hansa Fish River Canoe Marathon titles, and with it the South African K1 River Marathon Championship crowns, at the Cradock Sports Grounds on Saturday. Both races were far from sewn up with Hartley going into the second day with a two and a half minute lead while Birkett had to overturn a one second deficit over the 36km that make up the second stage of the Hansa Fish. Euro Steel’s Birkett and team mate Hank McGregor went toe-to-toe throughout the entire 84km and there was a feeling that the race was going to come down to an end sprint again, like it did two years ago. This time it was Birkett who ended on the right side of the result. “I am super stoked for sure but it shows that there is very little between myself and Hank,” Birkett said. “He probably came past me three times in the last two kilometres and I did the same. Luckily for me that when I went past him it was closer to the finish line! “It was awesome racing and I have huge respect for Hank. He is a phenomenal athlete and we have had some great tussles. The two could not be separated throughout the race and Birkett knew that there was a strong possibility that the race would end in a sprint to the line. “I thought that if neither of us made any mistakes then there would definitely be an end sprint, mainly because there has been nothing between us throughout the race. I knew there would be a lot of pressure coming into Cradock,” he added. In one of the surprise results of the day, Spanish ace Kiko Vega had a barnstorming paddle on Saturday to finish in third place overall. Clinton Cook relinquished his third place overall and slipped into fifth while Brandon van der Walt finished in fourth. “I can finally tick this off the bucket list!” an elated Hartley said. “I think that I have wanted to win this race ever since I put my foot in a canoe! To have a title as prestigious as a Fish title to her name, Hartley believes that it has been the culmination of a lot of hard work. “I threw myself into a Dusi after paddling flat-water for years, and that was so challenging. “The K2 Dusi was also tough but a little bit easier and then slowly but surely I did more and it always seemed that I would end second. Seven-time winner of the Hansa Fish Hank McGregor had to settle for second place after an exciting end sprint, however he loved every minute of the tussle. “It was a fantastic two days of racing and it was a win for both us to be out there fighting it out,” Euro Steel/Fenn Kayaks’ McGregor said. “I managed to catch Andy slightly unawares after the Cradock Weir but then coming into the finish he got the jump on me and he deserves the win. Euro Steel’s Jenna Ward made a real fist of the ladies race as she pushed as hard as she could on the second day, however, interestingly, catching Hartley was not her main priority. “I didn’t really keep up with the splits and didn’t worry too much about Bridgitte, I was worried about the big group of girls behind me!” she said with a smile. “To have a race where the top five girls all finish within a few minutes of each other is incredible and is great for our sport. In the ladies top five Varsity College’s Under 23 star Christie Mackenzie finished in third while Robyn Owen and Nikki Birkett finished fourth and fifth respectively. Varsity College’s Stewart Little and Christie Mackenzie won the Under 23 men’s and women’s titles while Maritzburg College’s David Evans and Epworth’s Amy Peckett wrapped up the Under 18 boys and girls crowns. In conditions that could be described as near perfect, pre-race favourites Hank McGregor and Bridgitte Hartley made off with the 2018 Hansa Fish River Canoe Marathon day one spoils at Knutsford on Friday. Euro Steel/Fenn Kayaks’ McGregor diced it out at the front of the race with good friend and K2 partner Andy Birkett over the tough 48km first stage. McGregor took home stage honours in a tame end sprint – leading by just a second overnight. “It was a cracker day today,” seven-time champion McGregor said. “We worked hard across the dam and then ran hard around the dam wall to the put in and from there it was pretty much a dice between the two us with a lot of fun thrown in on top of that. “There were a number of obstacles where we could make mistakes but we worked together and put one another under pressure a couple of times. On a race that has many testing obstacles throughout the 83km from start to finish, McGregor knows that there is a lot of paddling that needs to be done on Saturday if he is to wrap up and eighth Hansa Fish crown. “You can’t really plan for anything on this race and you can make a mistake pretty quickly. “I am racing the current world champion in a K1 so I’ve got to have some energy left in the tank,” he added. Without a K1 Fish title to his name, Andy Birkett is just a second behind leader McGregor going into the final stage. Despite there being a title on the line Birkett relished being back in his river K1. “Of course there is a race on the go but it’s incredible that we can enjoy the river wherever you are in field and we enjoyed every minute of today. “First-and-foremost you have to appreciate the river and after going through Keith’s and Soutpans we were both on a high and really just enjoying the day,” Birkett said. Rising KZN star Clinton Cook grabbed third place on the first stage, edging out seasoned Dusi racer Thulani Mbanjwa, with visiting Spanish ace Kiko Vega wrapping up the top five overnight. In the women’s race Euro Steel’s Hartley spent the majority of the day on her own following her decision to portage around the infamous Keith’s Flyover Rapid and that decision paid dividends as she ended the stage with a two-and-half minute lead over Jenna Ward in second. “I started quite slowly but when I got the other side of the dam portage I made sure I stayed clean through to Keith’s and then after that I put the hammer down a little bit,” Hartley mentioned. “At Soutpans I was really hoping to make it the whole way but I swam at the bottom, but it didn’t cost me too much time. Hartley has Ward, and then a group of three paddlers including Robyn Owen, Christie Mackenze and Nikki Birkett chasing her. She wants to make sure that Saturday’s final stage is as close to flawless as possible. “I am not sure what the gap is but you can never be complacent and just make sure that you race properly for the two days. Hartley’s tactic of getting into the lead and putting the pressure on the other paddlers to make up the gap paid dividends for the three-time Olympian. “I wanted to get ahead because I was a little worried about Soutpans. It is always tough one, especially with more water on race day. “It was an amazing day and it isn’t the end of the world to have one swim on such a good day!” she added with a smile. Jenna Ward, along with Hartley, is also in search of a first K1 title at the Fish to go with her 2017 K2 title. For Ward it was important that she stuck to her race plan and didn’t get carried away if she found herself behind early on. “I know that the ladies race on day one only starts after Soutpans so I just stayed as calm as possible throughout,” she said. “I was quite slow across the dam and shot Double Trouble in sixth so I contemplated shooting Keith’s but knew that I needed to keep focused on how I had planned my race. Varsity College’s Stewart Little was the first Under 23 across the line on Friday in eighth place overall, while David Evans was the first Under 18 paddler into Knutsford in 12th overall. Christie Mackenzie, also a Varsity College paddler, was the first under 23 lady home in fifth in the ladies race. Stage two of the 2018 Hansa Fish River Canoe Marathon takes paddlers 36km from below Knutsford to the finish at the Cradock Sports Complex on Saturday. 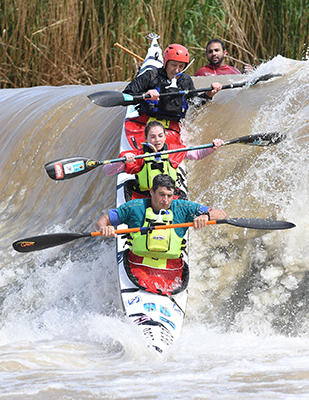 Paddlers from every corner of the country will converge on the small Karoo town of Cradock for the 37th edition of the Hansa Fish River Canoe Marathon that gets under way from Grassridge Dam on Friday and finishes at the Cradock Sports Grounds on Saturday. The event, which has become a staple on many paddlers calendar, offers guaranteed good water, challenging rapids and a weekend filled with the best Karoo hospitality. This year the race will double as the South African K1 River Marathon Championships, underscoring the high regard that paddlers and administrators hold for the two day, 82km event. The battles for the various national age group titles are always tightly contested and looking at the sharp end of both the ladies and the men’s fields the racing will be red-hot right up to the finish on Saturday. Seven-time race winner Hank McGregor returns to a happy hunting ground for him. The veteran hasn’t had much time in his river K1 this year, or in a K1 at all in fact, but with years of knowledge and a competitive edge like no other he will be a formidable opponent. Chasing McGregor down will be his Euro Steel team mate and K2 partner Andy Birkett. Birkett has won the last two K2 Fish’s , however he is still missing that K1 crown. Birkett’s form in 2018 has been exemplary and it wouldn’t be surprising if he was to take home the national crown and a maiden Fish singles crown on Saturday. Amongst the other men’s contenders are the likes of Jasper Mocké, who paddled to a third at the recent ICF Canoe Marathon World Championships, and Stuart Maclaren. Mocké is a fierce competitor so it will be exciting to see how he navigates his way through the big rapids of day one and whether he can keep up with what is probably going to be a blistering pace on the front. Stuart Maclaren represented South Africa at the recent Marathon World Championships in a K2 but his ability in a K1 must not be underestimated. He has spent a lot of time playing second fiddle to the top paddlers and will be hoping that the Fish can give him an opportunity to break into the big time. A dark horse in the fight for a podium spot could be young Under 23 ace Alan Houston. The Euro Steel and Maties paddler was at the Pre-Fish a few weeks ago sharpening his skills and might just upset a few if the two days go according to plan. From a ladies perspective it seems like it could be a two-horse race to the finish with Bridgitte Hartley and Euro Steel team mate Jenna Ward fighting it out for the title. Both have never won a K1 title at the Fish and have been in good form this year so the race should be an exciting one to watch. Hartley, who won a bronze medal at the Canoe Sprint World Championships in August, has improved her river skills from the last K1 race at the Fish and she mentioned that she is looking forward to the challenge. Ward has always had the river knowledge but her form at the Marathon World Championships recently, where she finished fourth in the ladies K1 race, will give her a lot of confidence going into the showdown. Young Christie Mackenzie might come into the fold, however she might be fighting it out for a minor spot on the podium. The 48km and 36km stages will test all the paddlers with exciting rapids and weirs to negotiate throughout, with close on 1000 paddlers entered, many of them in K2 and K3 craft in addition to competitive paddlers entered in K1s. With the bulk of the larger rapids on the opening day of the race it will be important for paddlers to negotiate the likes of Keith’s Flyover and Soutpansdrift Rapids successfully to ensure they get to the overnight stop below Knutsford unscathed. Stage one of the 2018 Hansa Fish River Canoe Marathon takes paddlers 48km from Grassridge Dam to below Knutsford. Seven-time Hansa Fish River Canoe Marathon champion Hank McGregor has a plan to make up for his lack of K1 river racing time, and the veteran says he is race fit and raring to go at this year’s edition of the race that gets underway from Grassridge Dam on Friday. McGregor’s racing calendar has been jam-packed throughout the year and with a K2 FNB Dusi title to his name, a K2 Marathon World Championships gold medal to his name as well as a plethora of surfski crowns his K1 has been gathering dust. “The last time I raced a K1 in a river was the Drak Challenge!” the king of marathon paddling said. “I have not done a lot of river training but that will make the racing this weekend exciting. McGregor will go head-to-head with good friend, Euro Steel team mate and K2 partner Andy Birkett for a shot at the 2018 title. Birkett is yet to win a K1 Fish crown, and McGregor believes that they will leave it all on the water. “Things have changed a lot since we last had a Fish K1 dice in 2016. Andy is great guy and full of talent. The Fish is not a short race with days of 48km and 36km respectively. Despite this, the fast-flowing nature of the river and the intensity of the rapids does make the race exciting and a slip-up can cost valuable time and ground. “It is always a fast race and it’s about making sure that you are in touch at the end of the first day. “You never want too much time to catch up on day two because then you expend energy that you will need for the final push to the finish. “Whoever makes the least mistakes is going to be the one in control because, although you can make up time, it can be really difficult. “The race is so unique in that you have a sprint across the dam, a hard portage and then you have to hold on through the rapids to the finish of day one. “Day two is a race to Cradock Weir and then the short, sharp sprint to the line,” McGregor analysed. Despite Birkett potentially being his biggest threat, McGregor knows that there are other paddlers that can upset the apple cart. “Every year there are names mentioned and in the past it has been Len Jenkins and Greg Louw but they aren’t going to be there this year. “Stu Maclaren and Jasper Mocké have been paddling well and are familiar with the river so they will be tough competition. “I always feel it comes down to who can handle day one the best. If you don’t expend too much energy on day one and avoid trouble you will have a chance on Saturday,” McGregor explained. With five races in as many weeks in different parts of the world, Bridgitte Hartley returns home to the 2018 Hansa Fish River Canoe Marathon next weekend hoping to bag a first SA K1 River Marathon Championship title. Hartley’s international jet-setting started with a bronze medal at the ICF Sprint World Championships at the end of August. She then went to the Nelo Summer Challenge and the ICF Canoe Marathon World Championships in Portugal. She returned home to win the VKB Liebensbergvlei Marathon after which she jetted to Ireland where she finished third in the Irish Coast Paddling Championships last weekend. A bit of recovery time is on the cards for the three-time Olympian. “I am definitely going to take a couple of days off!” she said with a relief. “It has been non-stop and I want to avoid being ill going into Fish. Hartley, who finished second at the 2016 Fish behind Abby Solms is looking to stamp her authority on river marathon racing. The 2018 Fish gives her the perfect opportunity as she searches for a first major marathon scalp. “I am going to head down to Cradock early next week so I can get in a few days’ worth of tripping on the river. “I am no river guru but last year in a K2 we managed to navigate ourselves down the river fairly well with only one swim at Cradock Weir. Having a bit of time in her river boat in the Free State a few weeks ago was important for Hartley who has only had that preparation time for the Hansa Fish. “I felt that I needed to race at the Liebenbergsvlei considering I have been in a sprint boat, marathon boat and a surfski as well over the past five weeks! “It is going to feel a little bit strange next week but I will give myself enough time to prepare,” she added. The Fish River often provides high drama with the race including some of the most exciting rapids in South African river racing. One of the most infamous is the Keith’s Flyover Rapid ten kilometres into the race and Hartley has made her decision about daunting obstacle. “I don’t think that I am going to be shooting Keith’s this year,” she said. “For me I just don’t think it is something that I need to shoot. The ladies race is going to be one of the most open in a few years with the likes of Jenna Ward and Christie Mackenzie vying for the title. Hartley understands that 2017 K2 winner Ward will be a serious threat. “Jenna is always an incredible competitor and will be tough competition. “She has had a good year with a fourth at the World Marathon Championships and she is in some good form going into the Fish. “It is going to be a great race and it’s exciting to see that there are a number of paddlers that can win the race,” Hartley added. As a very strong field of paddlers assembles for the 2018 Hansa Fish River Canoe Marathon, Spanish ace Kiko Vega has added his name to the impressive elite field that will start in A batch at Grassridge dam on Friday 5 October. The blond former winner of the fabled Sella Descent has raced the Fish twice before, in addition to strong challenges at the Berg River Canoe Marathon, and says he will return to the Eastern Cape in the Euro Steel colours wiser to the demands of the race. “It will be my third Fish and I think I already have the minimum amount of experience to try to perform well,” said Vega from his hometown in Asturias. “I have special enthusiasm for the type of competition I experience in South Africa, and because the Fish is the South African K1 championship this year, it will be very difficult, but I like that.” He said. Last year Vega partnered Siseko Ntondini to a storming sixth place finish in the K2 championship event, and is looking to substantially improve the 13th place finished he bagged on his maiden Fish in 2016. Through a friendship that he has struck up with Johannesburg based Dabulamanzi Canoe Club paddler Brian Longley, Vega has been able to arrange his race entry, sponsorship and the backing of Set Kayaks for the race. “I paddled the South African made Set Savage in the recent Sella Descent and it behaved perfectly,” he said. Vega added that racing river marathons in South Africa excited him because the standard of competition was arguably the highest in the world at the moment. “At this moment I think the level of kayaking in South Africa is the best, and that makes it more interesting for the competition and the public,” Vega noted. “My goal is definitely to be competitive at the 2018 Fish,” he added. He said that he was hoping to forge a stronger bond between the iconic event and the major events in Europe. “Eurosteel is helping to unite European sports culture and the Sella Descent in particular with the kayak culture in South Africa,” said Vega. Following a whirlwind few weeks that saw Andy Birkett claim the elusive K1 and K2 gold medals at the 2018 ICF Canoe Marathon World Championships, his focus has now shifted to the SA K1 River Championships at the Hansa Fish River Canoe Marathon from 5-6 October. Euro Steel’s Birkett emulated good friend and K2 partner Hank McGregor when he won his first K1 marathon title and followed that up with an impressive K2 crown to become the second South African to do the double at the same world championships. Having travelled back from Portugal and relocated to East London with wife Nikki, Birkett has finally caught his breath and managed to think about the upcoming Fish, an event that he looks forward to on an annual basis. “Well I ordered my boat for Fish a week ago so I have started thinking about it,” he quipped from his new home in Nahoon. “I have only paddled once since Portugal and I have been sick but I will get my preparations started. The much-publicised ‘bromance’ between Birkett and McGregor could take an interesting turn in Cradock in a few weeks as both will be hoping to get one over the other in the dash for the line; the racing will be hard but light-hearted. “It is going to be such an awesome race against Hank. I am going to give him a lot of grief and abuse on the river and I’m sure he is going to give it straight back to me! “We don’t get to race too many river races anymore so I am looking forward to getting back onto the river. “There are also going to be some other tough competitors there. Stu Maclaren, Kenny Rice and Jasper Mocké are all in great form so it will be a tough race for sure,” Birkett added. With the national K1 river championships and a first K1 Fish River Canoe Marathon title on the line, one would suspect that Birkett would be determined to win in Cradock, however the new father is not putting any pressure on himself. “I set myself a really big goal to win at marathon worlds – that was my main focus so I won’t be disappointed if I don’t win at Fish. “I am definitely going to go there and race as hard as I can but if that isn’t good enough, I am fine with that,” Birkett commented. Despite the relative lack of river racing, Birkett has been spending a lot of his time broadening his paddling skills and he will continue to branch out as much as he can. As the countdown continues to the 2018 Hansa Fish River Canoe Marathon on 5 and 6 October in the Eastern Cape town of Cradock, the massive field will be largely made up of recreational paddlers, for whom the 82 kilometres of paddling is as much about the social atmosphere as it about the challenges of completing the marathon. For the social paddlers, and for the droves of varsity students who make this event an annual pilgrimage, the unique ‘Pimp My Ride’ competition is an opportunity to get involved in the social fun of the event, and stand a chance of winning the coveted prize of the combined bodyweight of the winners in beer. Predictably enough a popular hit with the students, the competition requires aspirants entrants to decorate their kayaks, and dress up in fancy dress to reflect a different theme every year. 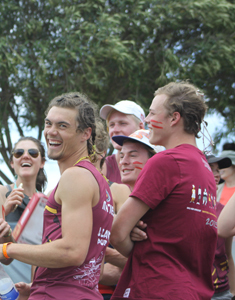 This year the organisers have announced a theme of “Cowboys and Indians”, which is sure to see stetsons replacing traditional paddling caps as the vogue headgear of choice on the river. Complicating the issue for the serious challengers is the issue that the competition is judged by a handpicked group of locals who observe both days of the race, up to and including efforts at Cradock weir in the final twenty minutes of the race. No matter how elaborate the decorations to the kayaks and the individual fancy dress outfits are, they need to survive the rigours of the two days on the river to give themselves a chances of winning the approval of the stealthy judges. Two years ago, the winning crew of Rhodes students launched an controversial appeal claiming that the combined weights of each paddler, plus their kayak and all their waterlogged equipment, was the amount of beer that they should win. In a case that looked set to challenge the country’s top legal minds, the winners eventually agreed that the volume of beer they had won would be limited to their combined bodyweight only. The theme pervades all aspects of the popular weekend, running like a common thread through the road trips to and from Cradock, the racing itself, and the well-supported parties on the Friday and Saturday evenings. As the entry for the 2018 Hansa Fish River Canoe Marathon nudges closer to the 1000 paddler mark, the social aspect of the race has been brought into sharp focus by another entry from the Perrow family that spans three generations. Since he quit serious racing in 2000, Mark Perrow, who won the Fish in 1988 with Graham Monteith, has taken friends and family down popular races like the Fish, Dusi and Drak Challenge. This year he has entered a K3 made up of his youngest daughter Kate and his 76 year-old father-in-law Brian Kurz. “My father in law might be able to do a Fish on his own, but with a hell of a lot of swimming! So it is brilliant to be able to take them down a Fish. It’s the fourth year in a row that I have done the Fish in a three-generation family K3. “I guess I am re-investing in the sport,” he added. The shift in focus has made the transition from his competitive years, where he had a reputation as a fiercely combatant athlete, to a more recreational paddler a lot easier. Not that this has entirely extinguished his competitive flame. “Look, I am not super fit,” he conceded. “We go as hard as we can, but the focus is on enjoyment. “For us it is more a journey than a destination,” he added. The Perrow three-generation K3 entry is part of the swelling majority of paddlers from all corners of the country that converge on Cradock every October to share the social spirit and adventure on the Fish River. Another strong performance from Team South Africa at the recent Canoe Marathon World Championships gives an indication of which of the nation’s paddlers are in the best form heading into the 2018 Hansa Fish River Canoe Marathon from 5-6 October. 2018 was a watershed year at the global marathon showpiece with now 11-time world champion Hank McGregor retiring from the men’s K1 race, leaving the door open for his Euro Steel team mates Andy Birkett and Jasper Mocké to lay claim to the coveted title. It was Birkett who impressed as he powered his way to his first ever senior K1 gold medal ahead of Hungarian Adrián Boros in second and Mocké in third. Birkett’s impressive form in his K1 might just push him into the favourite’s position for this year’s Hansa Fish with McGregor lacking a bit of race practice in his K1, despite him and Birkett storming to the K2 gold at Marathon Worlds. The trio of McGregor, Birkett and Mocké have all entered this year’s race for the SA K1 title at the Fish, however interestingly enough 2016’s third place finisher and two-time defending K2 winner Greg Louw has opted out of the K1 contest. The contest for the men’s title may well come down to an end-sprint between McGregor and Birkett, very much like it did in 2016 when McGregor just managed to get himself ahead and stay there to win the race by 21 seconds. From an international perspective this year will see the return of Spanish marathon racer Kiko Vega. Vega took part in the Fish in 2016 where he finished the race in 15th overall and will be hoping that his third visit to Cradock can yield a better result. From a senior ladies perspective, with the absence of Abby Solms, Jenna Ward must go into the showdown as the favourite following her impressive showing at the World Championships. Euro Steel’s Ward, in her first senior women’s world championships, paddled with determination to finish the K1 race in seventh place overall. Ward’s nearest rival and 2016’s runner up is her Euro Steel team mate Bridgitte Hartley. Hartley didn’t quite have the World Championships that she was hoping for and finished the race in twelfth place but she will be a contender following the vast improvement in her river skills. The next generation of paddlers that will be out to impress in the ladies race will be the under 23 duo of Christie Mackenzie and Sabina Lawrie. Both have completed three Hansa Fish’s and will be hoping to upset the older, more fancied pair. Mackenzie, who finished ninth in the U23 women’s race in Portugal last week, has proved that she is a river racing star after claiming two consecutive silver medals at the FNB Dusi. She finished second in a K1 in 2017 and then followed that up with a silver in a K2 this year. Lawrie, who came ninth in the U23 women’s race over one minute 20 seconds ahead of Mackenzie, is more at home in a surfski but will still be one to watch in Cradock this year. An entry from Louis Hattingh and Hamish Lovemore might get the ears pricking up from an Under 23’s perspective. Both have competed for the country at World Championships this year, Hattingh in the marathon showpiece, and Lovemore in the sprint world champs last month. A paddler that will also feature in the Under 23 showdown is Stewart Little. Little’s river skills are impressive and he too will be a force to watch, having enjoyed run of recent wins in the KZN regional races. From a juniors perspective Maritzburg College’s David Evans and Hamish Mackenzie will be the two paddlers to watch. Both have come off some good form and a bronze K2 medal at the World Championships so they could easily be fighting it out for the Under 18 K1 prize. In the junior girls race Caitlin Mackenzie and Amy Peckett equipped themselves well at the marathon world champs and will be the two favourites to win the Under 18 girls title in Cradock this year. Mackenzie finished just outside the medals in fourth and Peckett in 19th in Portugal last weekend but the river is a different beast and could even out the contest over the two days of racing.